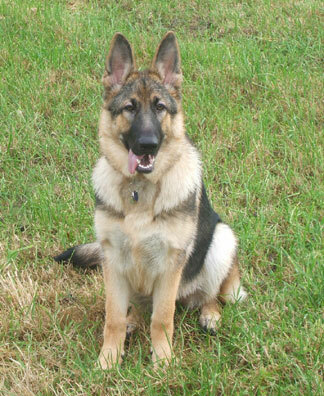 Cancer in the GSD happens just as often as in any other purebred dogs. Just say the word cancer and any of a host of undesirable thoughts will pop in your mind - and all with good reason. Cancer is one of the most common of diseases among pets and increases as the pet ages. In dogs, the frequency of getting cancer is much higher than that of a human being getting cancer. Additionally, it accounts for close to half the deaths of pets over the age of 10. Some cancers such as breast cancer, ovarian cancer or testicular cancer can be largely prevented by spaying or neutering your pet while it is still very young (6-12 months or so). Skin tumors in dogs should always be checked by a vet. Breast cancers have a high rate of malignancy in dogs - often 50%. Lymphoma is very common and is characterized by an enlargement of the lymph nodes. Testicular tumors are common in dogs - especially those having retained testes. Cancers occurring in the head and/or neck are common in dogs and often malignant. Aggressive and quick therapy is required. are harder to detect and very common. Watch for weight loss or abdominal enlargement. Testing for cancer can be done in a variety of methods - from x-rays or blood tests to actual biopsy samples(tissue samples). Most often, biopsies are required to diagnose cancer. Treatments for cancer in the GSD run the gamut. Since each cancer may be of a different type from animal to animal, and each animals system may react differently to the same drug, the care is highly individualized. Your veterinarian may choose from such options as chemotherapy, radiation, hyperthermia, surgery, immuno-therapy, or cryosurgery(freezing) to treat your pet, although combinations of the above methods are quite common. Now for the big question. Just what are the success rates of these methods in treating my pet for cancer? Just as in humans, the success rate depends on a number of variables - what type of cancer your pet has, how early you detect the cancer, how you treat the cancer and how strong your pet is - just to name a few. Sometimes the cancer can be cured if response is quick and the treatment aggressive but all pets may receive a better quality of life from therapy received. The best therapy seems, however, to be early detection through regular vet visits and keen knowledge of your pets overall rate of health at all times. Watch for changes and be aware should any unusual symptoms pop up. Cancer in the GSD today doesn't have to be a death sentence as it was in the old days.